These beach games for kids are also great for adults that want to act like kids for the day. I love playing silly games designed for kids and my husband is always such a great sport with them. To view the full ideas for any listed below, simply click on the underlined game name and it will open up in a new window for you. 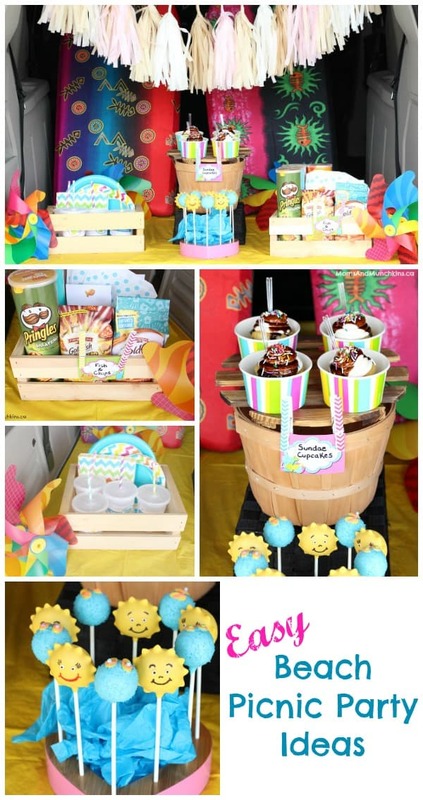 Be sure to also stop by our Beach Party category for even more fun ideas. 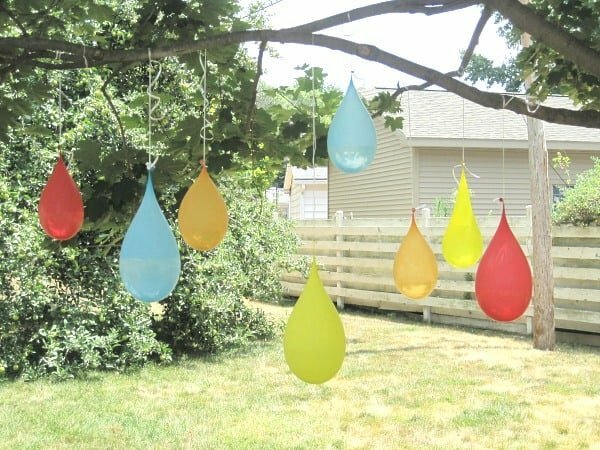 I love this idea for a water balloon pinata (pictured above) by Milk Allergy Mom! I want to try this activity today! We don’t have any trees on our yard so I’ll have to improvise a bit. This Pass The Water Game by A Girl And A Glue Gun is so easy and clever! Grab a few plastic cups and some water from the beach and you’ll be all set. Such a fun way to cool down on a hot day. 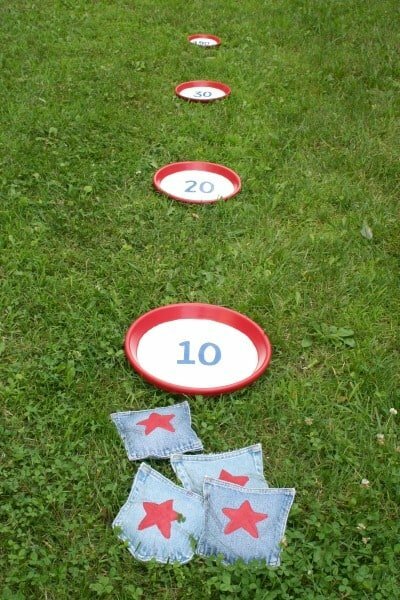 This bean bag toss game by Chica and Jo looks so easy to make and all ages would love playing this. It’s a great game for the beach or the backyard. 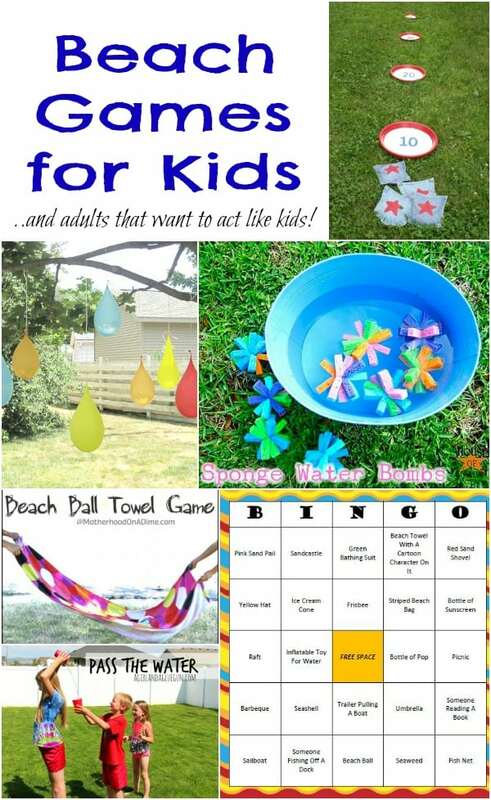 You could even substitute the bean bags for water balloons! 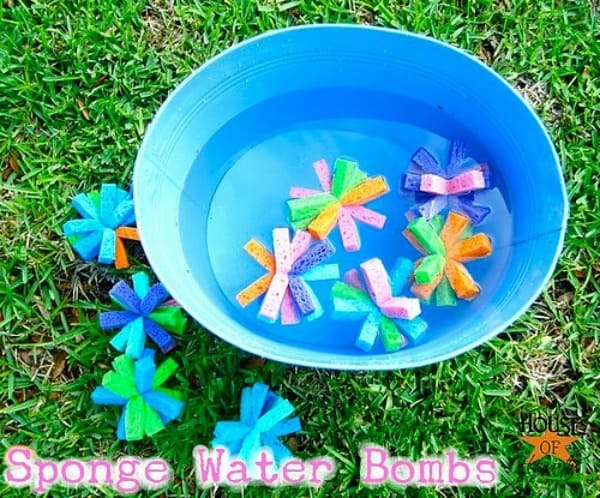 These Water Sponge Bombs by House of Hempsworths would be just as fun to create as it would be to play. You could make a sort of dodge ball game with these. 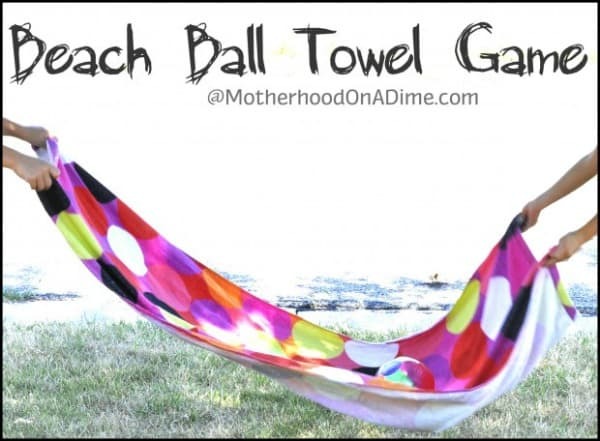 Another really easy game is this Beach Ball Towel game by Motherhood On A Dime. You could also substitute the beach ball here with water balloons. A little more messy but totally fun & cool on a hot summer day. A beach party wouldn’t be complete without beach balls, right? 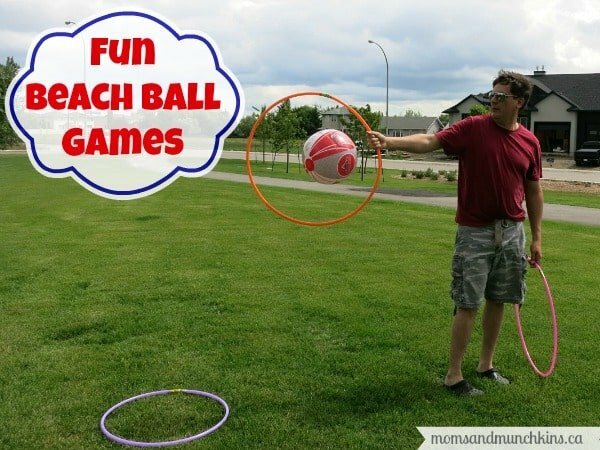 Here on Moms & Munchkins you’ll find fun games to play with a beach ball. 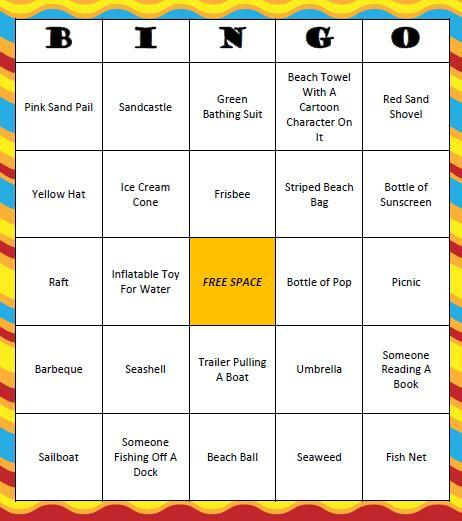 This free printable Beach BINGO game is so easy for all ages to play! Simple mark off the items as you spot them on the beach. 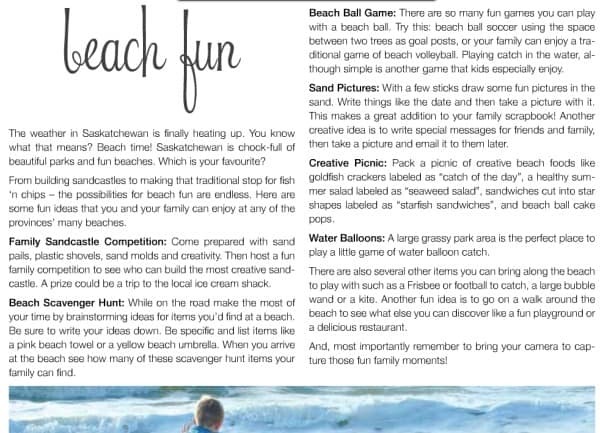 For more beach game ideas, visit the Beach Fun article I did for Pink Magazine. Looking for beach party ideas? Here is one of my favorites – a Beach Tailgate Party! 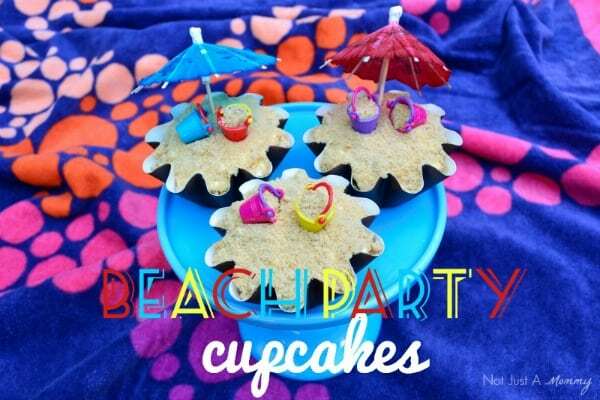 A party wouldn’t be complete without cupcakes and I know you’ll love these adorable Beach Cupcakes by Dawn! Don’t forget to visit our special Beach Party category for even more fun ideas! We’re always adding new ideas for family fun. Stay update on the latest by following us on Facebook, Twitter, Pinterest, Google + and Bloglovin’. Don’t miss our collection of FREE beach party printables! Great list! 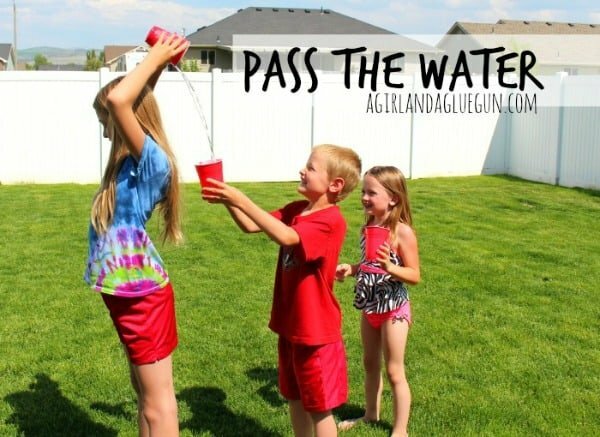 I love the pass the water game–all these could be used for summer parties as well! Looks like some really fun water games! Thanks for sharing! Great ideas!! Thanks for sharing at the After School Linky Party! Great ideas. I think we will have to try some of these if it is warm enough on our family camping trip. Thanks. I am writing a blog mainly focusing on homeschooling and learning Chinese & English for young children. There are freebies, printables, Chinese books, and activities too.